David Goode’s thematic survey of Reger’s organ music has reached the Fantasias and Fugues, some of the composer’s most sustained and dense compositions for the instrument. Goode’s achievement on this disc is conspicuous in the way that he brings lucidity and rhythmic vitality to even the thickest textures in the music. By and large that is to do with, respectively, the clarity of the registrations he chooses on the Klais organ of Bath Abbey and his ability not to get bogged down with the abundance of notes in the score but to keep on moving with persistence, even obstinacy. That is as true of the unearthly stillness of the first section of the Fugue on B-A-C-H as it is of the corresponding movement of Op. 29, with its active Bachian subject whose melodic profile recalls that of the Baroque master’s G minor Fugue BWV542 in its sideways steps in intervals of thirds and an octave leap. To some extent Goode’s focus in his performances comes at the expense of a degree of grandeur, and a sense of accumulation in tension and weight that might have been attained through both a more concentrated crescendo across the span of a work and pushing on with more urgency. His interpretation of the Fantasia and Fugue on B-A-C-H is noticeably more low-key than the magnificent sweep and structure created by Francesco Germani in this work on the organ at Selby Abbey for example. The Fugue of op. 135b does not surge ahead towards its triple forte climax with quite as much thrilling momentum as it should, and there is not the sense of release in tension at the more dynamic section in 12/8 time – one thinks of the similar effect in Bach’s ‘St. Anne’ Fugue at the passage in the same time signature before that theme combines with the earlier subject, surely serving as Reger’s model, since he follows the same pattern. The impact of Goode’s performances lies much more within individual moments of the music rather than the overall structure of each piece, with beautifully detailed and attentive registrations, for example the watery timbre at the beginning of Op. 135b which sounds more like Messiaen, the flourishes at the opening of the Op. 57’s Fantasia, and the tauter counterpoint of Op. 29. 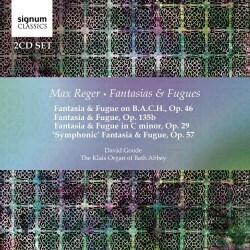 The stamina required to bring off each piece on this recording as an intact whole is no mean feat either, and Goode’s achievement here can only be applauded if this somewhat more subtle and humane approach wins people around to Reger’s organ music who might otherwise find it forbidding.